The ExoAtlet Exoskeleton assists people with full or partial lower body paralysis, as well as people with muscle weakness to perform a walking gait. This has been shown to improve blood pressure, decrease muscles and bone degeneration, and prevent urological diseases and disorders. In addition to walking, the ExoAtlet exoskeleton can be used to go up and down stairs. Lastly, ExoAtlet is experimenting with using electrodes to stimulate the contraction of people’s muscles as a way of improving their fitness. ExoAtlet is one of many robotics companies working with Skolkovo, an innovation cluster based in Moscow, Russia. Skolkovo provides these companies with resources and expertise to encourage their success. Below is the video of a man walking down the aisle to be married in an ExoAtlet Exoskeleton. 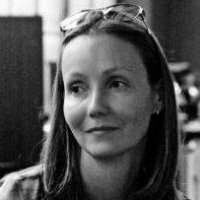 Ekaterina Bereziy is the Founder and CEO of ExoAtlet. She studied Mechanics and Mathematics at Lomonosov Moscow State University and has a Master’s in Business Administration from the Russian Presidential Academy of National Economy and Public Administration. Audrow: Hi, welcome to Robots Podcast, can you introduce yourself? Ekaterina: My name is Ekaterina Berez. I am the co-founder of ExoAtlet, an exoskeleton for rehabilitation. Audrow: Can you tell me a bit about ExoAtlet? Ekaterina: ExoAtlet started at 2014. We developed our project for 2 years, but that is not the only time that we had together. The team joined with this type of development 15 years ago. ExoAtlet is the result of our investigations from 15 years. Now, we have the first version of the exoskeleton that provides the rehabilitation for people with their injuries. The next generation of ExoAtlet will provide the possibility to work for people after strokes. Audrow: You mentioned the team has been working for 15 years. Where has this taken place? Ekaterina: In the Damascus State University laboratory, a mechanical and robotic laboratory. We developed a lot of different kind of robots, and they started up the World Festival of Robotics for students and for PhDs. They worked for different kind of system controls for wheels robots and for walking robots. The exoskeleton was one of the ideas that they had for this for years. As the technical solutions have been providing good for making the kind of provides so the ideas to develop the exoskeleton for this exact idea (like rehabilitation) has been implemented and we started the company and conducting it like a commercial product. Audrow: What stage of development are you currently at? Do you have users? Ekaterina: MD, just medical doctors. We will provide for medical doctors through their implication that we will help them to decrease their assistance of the ExoAtlet for the patients who can work, who can already make steps by themselves. To provide them less help. Then to make them work during the training. Audrow: Almost like an exercise or rehabilitation. Now, about Skolkovo, how you are related to them? Ekaterina: Skolkovo Foundation is the government fund that provides help for startups. We started to the member of Skolkovo in 2014 as we started up the company. We are working on this Skolkovo robotic sensor now in the territory of this center. Audrow: That territory is basically a campus that startups work at? Ekaterina: Yeah, it looks like a campus and the robotics startups have facilities to make engineering product types, and work with equipment to try and prove some concepts. Also, Skolkovo has their IP center that helps us a lot with our intellectual property and to issue patents. Skolkovo provides a lot of services for startups. Now they have good infrastructure for the kind of startups who has a great idea, but not a lot of stuff to have goods or to have the specialist for each kind of idea, for implementation. I mean, for example, the PR support is one of the most important things for startups, because it’s necessary to get feedback from the market, and to involve the development process from the market, people who are close for example, in order to implement this idea in real life. The PR solutions are really cool. And for us it was helpful. Some key medical doctors work with us now, and who made very important clinical trials for us. We have a connection with them, because of the PR support of Skolkovo team. Also, we need funding. It’s investors who can provide their investments for developing the product. Skolkovo has their own Skolkovo fund that is government money. It’s a grant money that they can provide the startups to support some ideas that are very innovative. Maybe too much innovative for the venture capitalist. Skolkovo provides the grant money for the first stage of development to prove this kind of concepts, and next step is to invest. It’s great support. Audrow: Would you describe the ExoAtlet exoskeleton? Ekaterina: The first version of ExoAtlet is the exoskeleton for rehabilitation people with the spinal cord injury. We make clinical trials with different kinds of level of spinal cord injury even with very high level. It works. Now, we have 2 models. There is one for hospitals, and for working for medical doctors with the patients, with the different kind of patients. I mean with the height of 160 centimeters. Audrow: Okay, so about 5’2 to 6’2. Ekaterina: The weight is about 100 kilos, maybe up to 120 kilos of the patient for hospitals to use. Another model is for personal using at home. The ExoAtlet is adjustable, it’s easy to fix the exact lenses of the part of legs. Audrow: What does it look like, before we talk about adjusting legs. Ekaterina: It’s just like the external skeleton. External metal parts that fixes to the legs and to the upper part of the body. With the cells that you can put in your shoes and the person can put it on in a sitting position. Audrow: It has rigid components that go along with the legs on the outside of the leg? Audrow: Then a foot insert that goes into the sole or goes with the sole of your shoe. There is a component that the user wears that’s sitting about at their lower back? Audrow: They are strapped in by various straps that you pull? Kind of like snowboard boot straps. Ekaterina: Yes, it looks like the snowboard boot straps. It’s very easy to strap it and fix it. Ekaterina: Yes. It’s adjustable. We have a lot of adjustments because all people have different measurements. Audrow: How does this exoskeleton compare to the exoskeletons of similar companies? Ekaterina: Most of the skeleton for rehabilitation tried to solve the same problem. It’s to give an easy way to stand up, to start the walking movement, and provide walking steps to speed up the rehabilitation process. The differences in engineering solution, in some plugins, and in that way the exoskeleton works. I mean some of them, for example, have the initiation of the movement. It means that the patient with the not completely damaged spinal cord can initiate the moment. Or, for example, some of the exoskeletons can’t help with standing up to a totally disabled person. It means that they don’t have good parts, or good motors to help the person to stand. They can make movements and make steps when the person is already in vertical position. Most of the exoskeleton needs crutches. It’s because the patient using the exoskeleton needs to keep their balance. The only way to keep their balance is to have the third points that you can get with a crutch. Audrow: In our conversation earlier you mentioned you can use your exoskeleton on stairs? Ekaterina: Yes. Normally in the rehabilitation process medical doctors don’t use stairs, but if we see or if we talk about the people of the stroke, for them they are going up and down stairs. It’s one of the exercises that improves and speeds up the rehabilitation process. Also for the person using it we need to go up and down the stairs because we have a lot of stairs in our surroundings. Normally to go out of the apartment you need to go down the stairs. If we talk about the personal use for people who, for example, has a totally damaged spinal cord, it means that it’s rather difficult to have a hope to reconstruct to start working by themselves. It means that this kind of exoskeleton will provide them help in walking. Of course, we need to go up and down the stairs and stairs are different with the different heights of the steps, and it means that you should adjust the height of the step according to the stairs. It’s a very important thing. Audrow: Is this something that the user needs to adjust or is there any sensing onboard that tells how high the steps are by itself, and then adjusts how large of the step it will have to take? Ekaterina: Now it has sensors, but it works with the stairs, but sometimes you need just to step towards the obstacle. It means there are different kinds of obstacles, and sometimes you need to set up yourself like a pilot, the exact height to make a step. The situations are different. We have a variety of possible adjustments. Audrow: The step parts and those types of things. To step higher or lower, further, shorter. Ekaterina: Yeah. Of course, different people have different ways of walking. Some of us have very high steps. For example, normally for us to make high steps, but others make very short and low steps. We can adjust it, and not with the program is plug in the computer and do it once and for years. Now you can adjust exact minutes just by changing parameters in the application. Audrow: Now, what kind of actuators are on the exoskeleton? It has electric motors? Audrow: Where are they? Tell me a bit about them. Ekaterina: They are in the upper parts of the leg. Audrow: They are at the hip and the knee, correct? Ekaterina: The knee yes, but they’re just a little bit higher. It works, yes. It moves with the knee joint and the hip joint, so 4 of them, because we have 4 joints. It works with batteries that are set up also onboard. It’s about 6 hours that you can walk. Audrow: That is a long time. About 6 hours of regular use? Ekaterina: Yes. Just walking on the normal surfaces. If of course if you will stand up and sit down for 6 hours batteries needs more taxing. You need to charge it. Audrow: Yes. For sure. What kind of sensors does the exoskeleton have? Ekaterina: It’s a lot of sensors that helps to get diverse composition. Audrow: Skill accelerometers and gyroscopes to do some sort of status on this? Ekaterina: Yeah. We have all of them, and we have some sensors for initiation to get information that it will be initiation of movement by their leg. Audrow: Would that force sensors? Ekaterina: It’s force sensors and mind sensors. Audrow: The mind sensors are very interesting, but the force sensors, where are they in the exoskeleton? Is it on the feet? Ekaterina: It’s on the feet, yes. It’s on the strips. Audrow: On the strips; what do you mean? Ekaterina: I mean that it’s onboard of the ExoAtlet. Audrow: It’s on the component like along the legs? Sensing the amount twerk at the motor, at each joint basically? So what do you use that information for? Ekaterina: For system control. To make more comfortable for a person, because when you wear anything that provides some movement you need to be comfortable. It’s one of the great problem how to provide comfort for person that can’t do specific moments. It’s huge that should fit well to make the comfortable moments. Audrow: You also use the 4 sensors, so the ones in the feet in this kind of thing or the ones in the feet to help the user to walk by themselves, correct? You determine where the weight is loaded and then you decided if you can step or not? Is this the approach? Ekaterina: It works like this. We have mind stimulation system also. Audrow: I want to get to that after, but just to see if I understand the force sensors it’s basically if I have my weight on my right leg then I know I can move my left leg kind of thing. The force sensor would determine that I have my weight on my right leg, so then my left leg moves. Is this how it works? Ekaterina: One of the solutions can be like this. We have a little bit different solution. It does matter. This kind of technical details they are very our specifics. This kind of idea can work. It means that you need to make the system control, but will provide the most natural pattern of walking. From bio-mechanical point of view you can do it like a normal person. This is the goal. There are different kinds of system controls that use their data from sensors, from their voice sensors, from their food on these trips, on the different points of the leg, because it means that the angles and so on. You can get the exact information of the movement that is in the second, and provide by the drives the next phase of movement. Audrow: Electromyogram sensors sense the electric potential on the skin, and this potential increases when things like a muscle flexes. If I flex my muscle we can detect this with an electromyogram, a myogram sensor on it. You are using this for control of the exoskeleton as well? Ekaterina: No, we use the myostimulation systems. It’s a multiple control system. It’s for stimulating, for additional stimulation of muscles. For example, who have the people who have damaged spinal, completely damaged spinal cord, we can provide them walking, but we can’t make their muscles work during this process, because their spinal cord is completely damaged, and there is no signal. It means that we can stimulate their legs muscles, and it’s like the stimulation of the normal walking process of muscles during the walking. Audrow: Are you electrocuting the muscle in order to stimulate it? Ekaterina: Yeah. We put on the skin the electrodes, and we will provide their electrical nodes to the muscles through the skin. It makes muscles work. Audrow: It’s like when you are shocked. When you get shocked somehow, and all of your muscles contract. It’s like that kind of thing, but you are using those deliberately to help the user to walk? Ekaterina: Yeah. It doesn’t help to the walking process, but it helps muscles to reconstruct their function, because we provide the signal, the electro stimulation signal to exact muscle that must work on this phase of walking. Audrow: How much voltage are you applying to the, I mean is it allowed? Does it hurt? Ekaterina: No. It doesn’t hurt. It can be just from the very low that you as a normal person would never feel, but the muscle will be on the strong physical condition. It’s adjustable. It’s there. It’s one of the very complicated parts of physical therapy. It’s normally implemented during physical therapy programs. Now medical doctors use it in the position when the person laid on the sofa for example, and they do this kind of mind stimulation without movements. We implemented to the exoskeleton, and combined it with the steps. We use the information of the angles from the joints and provide to the system, the control mind stimulation and elector signals. Audrow: Has this approach been proven to be beneficial to do the steps in combination with the electrical stimulation? Is it proven or have you found that the results of doing these 2 things is better than the result of doing either separate? Ekaterina: Now we have a big investigation. We have the clinical trials that the results of it will be comparing between the ExoAtlet with mind stimulation system. It will be interesting result. Audrow: What was the second one? Ekaterina: Local Mob. It’s their rehabilitation. They are very big and very famous rehabilitation equipment. It’s very expensive, so it costs about some hundred thousands dollars. Normally it’s on the rehabilitation centers, because it’s for the big one. It’s with the treadmill and their exoskeleton implemented in this system. It’s proved, and they were a lot of researches and clinical trials that proved this kind of robotic mechanical therapy. In Russian market we have about 75 such kind of machines. Now we have the clinical trials. The idea is to compare their results of 2 weeks of training for patients who can walk a little bit, who can do some steps. It’s not the people with the completely damaged spinal cord, but it’s the spinal cord damaged injury people who feel their legs, and who can do some steps. We will measure the differences of improvements. Audrow: I see, and use that to determine the validity of the method. That makes sense. What are the future steps for ExoAtlet? Ekaterina: We will develop the next version. We are working on it. We are on R&D process, the ExoAtlet for people of the stroke. Then the cerebral palsy is one of the biggest problems that is around the world. We will provide to different exoskeletons to the market. Audrow: What would you think would be a timeline for this? Ekaterina: We plan to make a presentation of the ExoAtlet for people of the stroke next summer. It will be summer of 2017. For children with the cerebral palsy it will be the next generation maybe in 2 or 3 years. Audrow: Do you have any stories or anecdotes of people using your exoskeletons? 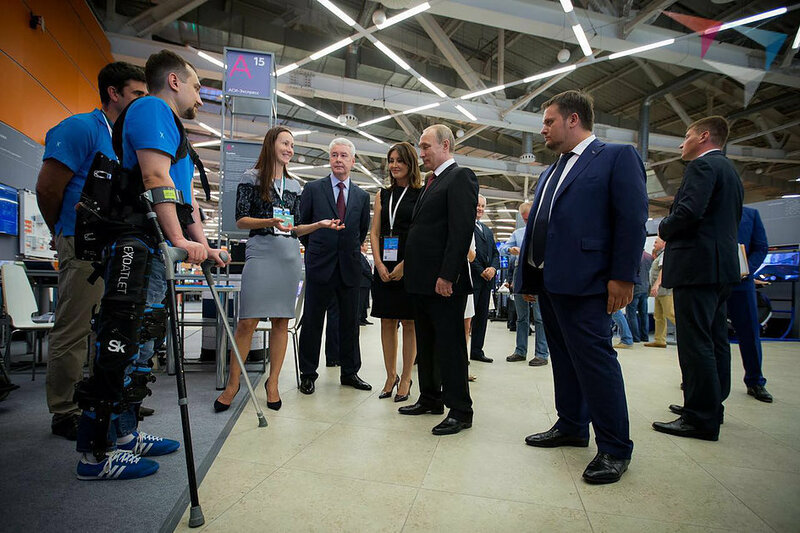 Ekaterina: We have one exoskeleton that has been implemented in hospital in the north city of Russia. There is one patient who walks with it almost every day and use it almost every day. One of the really interesting stories that it was his own idea. It wasn’t like a PR idea. He decided to marry, and for him it was very important to stand, but not to sit during this process. He entered the church with his future wife wearing the ExoAtlet and using the ExoAtlet. He made steps with this kind of sound It’s really so cool. That Saturday morning was very interesting, because he came to his wife, and he provided her his hand and she supported him a little bit, but it was really impressive.